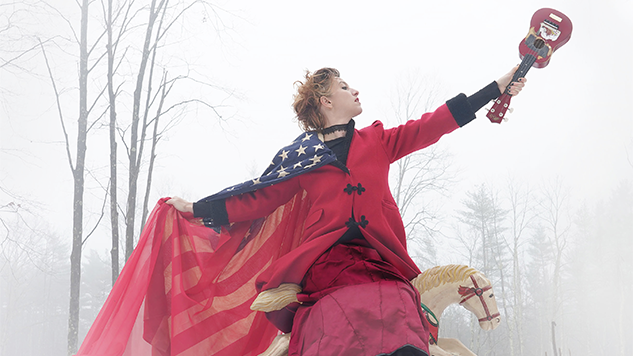 Amanda Palmer Addresses Abortion on New Single, "Voicemail for Jill"
Amanda Palmer finally caught her self-proclaimed “white whale of songwriting” today (Feb. 20), otherwise known as “Voicemail for Jill,” a single focused on the reality of abortion. The track comes off her forthcoming album There Will Be No Intermission, a completely crowd-funded effort to be released on March 8. In a statement, Palmer admits that she “struggled for years to find the right way to write about the subject without sentimentality, preachiness or apology.” Palmer found that she was ready to finish “Voicemail to Jill” after her tour brought the 42-year-old to Dublin in the wake of Ireland’s referendum to legalize abortion. For much of the song, the Dresden Dolls singer sounds on the edge of tears as she highlights the connection shared by those who have had an abortion. “I wrote this song as a gift, a handbook for any woman on her way to have an abortion, and as a reminder that this is not an experience you have to face alone,” Palmer, who herself has had three abortions, added. There Will Be No Intermission sees the ukulele enthusiast reuniting with producer John Congleton, with whom she previously worked on Theatre Is Evil. Palmer is also releasing an accompanying artbook of narrative photography, created with art-team Kahn & Selesnick, to mark the record’s release. Listen to “Voicemail to Jill,” watch Palmer’s duet with Neil Gaiman at the Paste Ruins and check out her album’s details below. You can explore her upcoming tour dates here.